This weeks wine choice was inspired by a recent twitter chat about Hungarian wine. Since I had heard of Tokaji but never tried it, Mark at West Palm Wines suggested we taste this dry Tokaji called The Oddity. How could I resist? And speaking of oddities, we found this Potato Chip Gouda at Cheese Please. Although it sounds quite strange, it’s one of their best sellers and it’s a type of Gouda. What an obvious choice for us! I suppose we were playing off the “out of the ordinary” theme for this entry because we took our tasting notes at 1am on the last night in our house. Now that’s a great reason to have Wine And Cheese! The only thing that I really knew about Tokaji wine was that it’s usually pretty sweet. When we purchased the wine though, the salesperson told us that it’s one of those wines similar to Riesling that can range anywhere from dry to sweet and for that reason, it’s good with many different types of food. Another thing worth mentioning is that Furmint is the grape used for dry Tokaji wine, so if you’ve seen that grape, this was likely the type of wine you were drinking. And if you are wondering, Tokaji, is the name of the wines produced in the Tokaj region in Northeast Hungary. Now that we’ve learned a few things, its time to take some tasting notes! This wine was appropriately named The Oddity because Neil and I smelled and tasted completely different flavors. When I swirled the wine, there was a strong aroma that seemed kind of pungent and sour. Neil was able to identify fruit aromas of melon and cantaloupe. As I sipped the wine, I noticed mineral, tart, and sharp flavors with a high acid and a hint of effervescence. Neil said it was melon then honey vanilla and then tart. He could also notice the oak and that the flavor coated his mouth. Its times like this that I wonder if Neil and I are even tasting the same wine. Guess that’s how it got its name. We were really curious about this cheese! How could we resist trying another type of Gouda? After all it is our favorite type of cheese! And who would think of potato chips in cheese? When I took my initial sniff of the cheese, I thought it definitely smelled like Gouda and salt! Neil and I were pretty tired during our tasting so my notes are a little tough to interpret but I think Neil skipped describing the aromas and only told me flavors. He said the cheese was creamy and salty with a bit of barnyard funk, then some potato chip. It reminded him of a plain chip with Heluva Good onion dip. When I tasted the potato chip gouda, it was smooth, rich, milky, thick and coated my tongue. The goat’s milk flavor came out in the finish and there was a hint of tart on the sides of my tongue. And for a fleeting second, there was a flavor of crunchy raw potato, but once Neil brought up the Heluva Good dip, I definitely agreed. It was almost like a sour cream chip! I think it took a few tastes for the flavor to build up and then all I could think of was a baked potato with sour cream! As we paired the Tokaji and Potato Chip Gouda Neil found the wine and cheese to both be thick so one didn’t cut the flavor of the other. 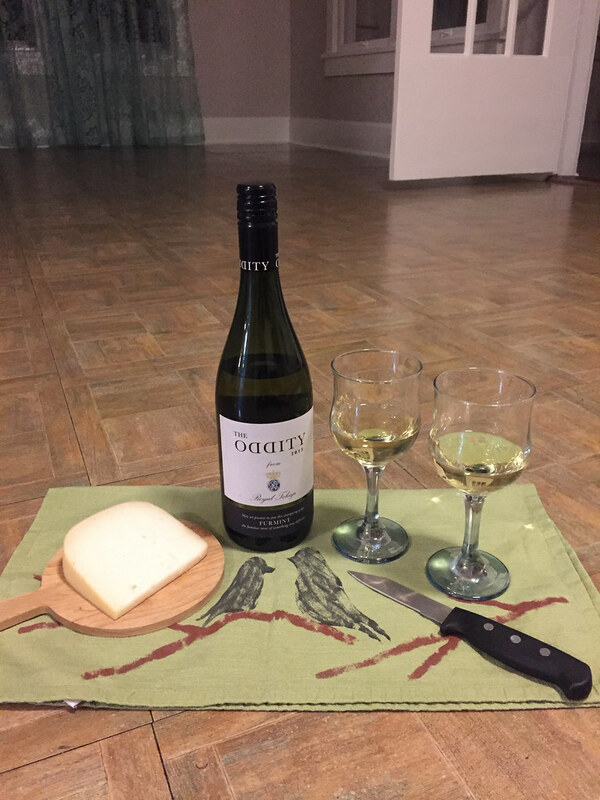 He noticed the cheese to become a little saltier and the mineral flavor of the wine increased. There were nice splashes of fresh goats milk and honey too from the pairing. When I did the wine and cheese pairing, I had a different experience. The wine didn’t change much for me aside from the sour and tartness becoming more intense. There was a reaction from the cheese coating my mouth and throat, I was able to feel the wine down my throat and around my teeth. The cheese maybe became a little dryer. Although it wasn’t a positive change, there was a noticeable change from the pairing of wine and cheese so at least it was interesting. One of the pairing suggestions was asian food so we tried the Tokaji with Chinese Food the next night. I was curious to see how the wine would change. Sadly it was still just as tart and sour to me. Maybe I was trying to go too far against the grain with the dry version of Tokaji. Next time I’ll have to give the sweet version a try. As far as Neil, well I guess he won, for the better tasting wine and the delicious pairing.